Shell to Sea are calling for the Minister of Justice, Francis Fitzgerald to seek that the inquiry into the behaviour of undercover British police (entitled the Pitchford Inquiry) be extended to include the activities of undercover police in Ireland. The Pitchford Inquiry is so far only investigating undercover policing activities in England and Wales, however the German Government, the Scottish Government and Northern Ireland's Justice Minister, Claire Sugden have all called for the remit of the inquiry to be widen to include the activities of the undercover British police in their jurisdictions. 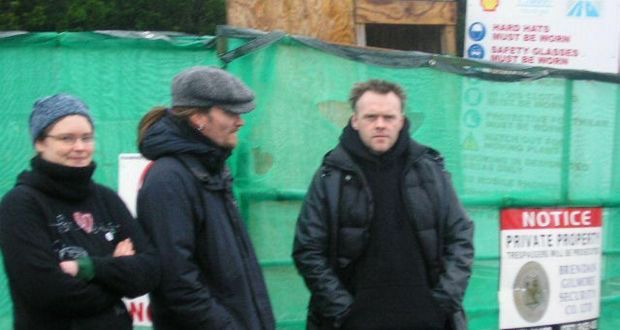 It is known that undercover British police officer, Mark Kennedy operated in Ireland intermittently for a number of years including monitoring Shell to Sea in March 2006. It is suspected that after leaving the British police Mark Kennedy provided information on protesters to energy companies. Shell to Sea is calling on Minister Fitzgerald to add her name to this list of other Governments and call for the Pitchford Inquiry to extend the inquiry into activities of undercover British officers in Ireland. Shell to Sea have also made a submission to the Pitchford Inquiry and British Home Secretary seeking the terms of the inquiry be extended to include Ireland. Available here. Who authorised Mark Kennedy’s (& any other undercover police officers) trips to Ireland? What State bodies knew of the presence Mark Kennedy and other undercover police officers during their deployment here? Who chose the Irish campaign groups, activists and protests to be targeted? Did Shell or any other companies or people connected with the Corrib Gas Project receive any of the intelligence or evidence that was gathered by Mark Kennedy? Was any of the intelligence or evidence that was gathered by Mark Kennedy (or any other undercover police officers) used in the prosecutions of protesters opposed to Corrib Gas project? Who paid for Mark Kennedy's undercover work in Ireland? Did any of the money come from the Irish Exchequer? What lawful authority did Mark Kennedy have to undertake his undercover operations in Ireland? What details were the Gardaí and other State bodies given on Mark Kennedy's undercover operations prior to him being deployed in Ireland? What, if any “rules of engagement” with campaigners were given to Mark Kennedy during his time as an undercover agent in Ireland? What oversight did the Gardaí or other State bodies have on Mark Kennedy during his time in Ireland? Shell to Sea's submission to the Pitchford Inquiry is available here.